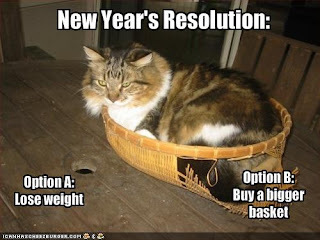 Apparently we’re not supposed to make New Year’s Resolutions because all it does is set us up for disappointment. I certainly see how that could easily happen. After all, some resolutions involve overnight changes and dramatic impossible goals… “I’m going to lose 30 pounds in a month!” or “I’m going to quit smoking, cold turkey, tomorrow!” for example. Others are too vague… “I’m going to lose weight” or “I’m going to keep the house cleaner.” Well, gee, drop a pound and vacuum the carpet and you’ve technically done it. The fact is, for whatever reason, our behaviors are incredibly hard to change. We’re all naturally resistant to new ideas and new ways of thinking.. creatures of habit, if you will. I’m no exception. I like to learn new things as much as the next guy, but when I see new equipment at the gym or something on my phone or computer requires and upgrade, I get a little grumpy because I have to train my brain differently. So it’s only natural that whatever resolutions we set for ourselves are going to be hard to keep. Technically it’s a new year, but it’s still only a week after we were the same lazy fatasses we’ve always been. What makes us think we’ll change overnight just because the calendar did? 1) Write it down. You can think “I’m going to put $5,000 in my savings account this year” all you want, but it’s far more effective if you see it in writing. As a writer, I carry around a spiral notebook with me where I write down story ideas, first drafts of articles, and my to-do list. On the first page of my notebook is a list of goals. Every time I buy a new notebook, I re-write them and add any new ones. They’re the first thing I see when I open my notebook so they’re constantly in my mind. If they’re always on your mind, you’re more motivated to go about accomplishing them. 2) Break it down. Say your goal really is to save $5,000 this year. Unless you’re making six figures (and if you are, lucky you!) that can seem like an insurmountable amount. But by breaking it up into smaller goals, it doesn’t seem so bad. $5,000 divided by 12 months means you’d have to stash away about $417 per month to reach your goal. If that seems too high, your goal can be $200 plus your tax return or any extra money you make from selling things on Craigslist, etc. If your goal is to lose 20 pounds, do the same thing. Unless you’re morbidly obese or your metabolism somehow magically skyrockets (and if that happens, please tell me how), that’s going to take some time. If you start by making small changes like cutting out soda and fast food and working out three times per week and slowly work your way up… or, if you like numbers, say you’ll lose five pounds per month for four months… it seems much easier and realistic. Easing yourself into a fitness routine makes much more sense than those crazy people you see sweating their big butts off at the gym six times per week in January and then never see again. The cliché is true, every long journey begins with a single step. 3.) Be realistic. I truly believe that if you want something bad enough and are willing to work hard and focus your energy on it until you get it… it’s yours. However, I also believe in being realistic. If you set huge, monumental goals for yourself and except to just magically accomplish them… you won’t. It’s common sense, yet people do this all the time. Dream big, but be realistic. 4.) Prioritize. If you make a big, long list of resolutions for the year, write them down and break them down… you’re going to get a migraine, tear the list up, sit on the couch and eat a chocolate bar. As much as humans hate change, we hate feeling overwhelmed as well. By prioritizing your goals, you can focus on one or two at a time without feeling stressed. Start with the one you want or need to accomplish first (say, weight loss because you want to look hot on your upcoming vacation) then go to the ones that, while still important, can wait (like cleaning out your closet). 5.) Visualize yourself achieving the goal. This is probably the most fun part of goal-setting, aside from actually completing the goal. Imagine how amazing you’ll feel once you’ve finally kicked your nicotine habit or saved all that money. Imagine how relaxed you’ll feel, how you’ll be more prepared for an emergency. Close your eyes and see yourself after months of diet and exercise have helped you lose the weight. As children, we’re discouraged from daydreaming. As adults, we realize that not only is it legitimately helpful, it’s fun. Remember, it all starts with desire. Before you set out to accomplish something, you have to want it with your whole heart. It took me my entire life to learn this and I still have to remind myself of it constantly. If you don’t want it bad enough, there’s no way in hell you’ll be willing to do the work it takes to get it. So don’t let your 2010 resolutions discourage you. Let them guide you and keep you focused for living your best life… because each of us deserves nothing but the best. I seem to set too many goals every year and rarely accomplish any. I think prioritizing and constantly reminding myself of them would be a big help. Great post Jessica!